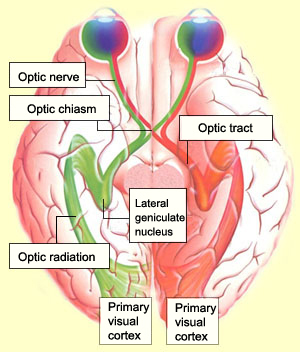 The optic chiasm, also called the optic commissure, is the X-shaped structure formed by the two optic nerves, which pass backward from the eyeballs to meet in the midline beneath the brain, near the pituitary gland. Nerve fibers from the nasal side of the retina of each eye cross over to join fibers from the lateral side of the retina of the opposite eye. The optic tracts resulting from the junction pass backward to the occipital lobes.